The Amazon Brand Registry program provides a means for brand owners to detect and report counterfeit or infringing uses of their trademarks on Amazon.com. 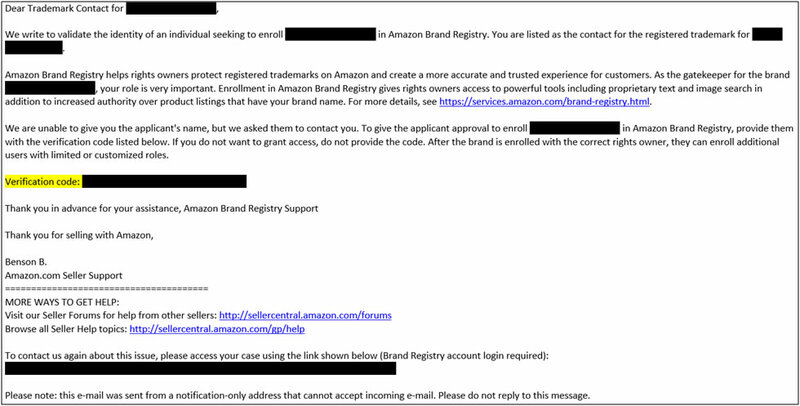 According to the website, the Amazon Brand Registry program “gives you access to tools that enable you to more accurately represent your brand, find and report violations, and share information that can help us proactively prevent violations.” Amazon Brand Registry Benefits Page (last visited 9/7/18). To enroll, a brand owner must have a registered text or image-based trademark. During the part of the enrollment process which requires applicants to verify their ownership of a registered trademark, an automated email is sent to the correspondent listed on the U.S. Patent and Trademark Office’s records for the given trademark. The email contains a verification code that must be used by the applicant to complete the Amazon Brand Registry enrollment process. A redacted copy of an example email is included below. Once the verification code is sent to the trademark correspondent, they must forward that code to the applicant in order for the applicant to complete the enrollment process. Recently we became aware of situations where false applicants tried to claim ownership of various trademarks. These false applicants began the enrollment process, which generated verification emails to this firm as the listed correspondent. Because it was clear that the applicants were not the actual trademark owners, the verification codes were withheld. Please be aware of these types of false ownership claims and alert any listed trademark correspondents on your registered trademarks to watch out. Do not forward Amazon Brand Registry verification codes to anyone you do not immediately recognize as the rightful trademark owner or someone associated with the rightful trademark owner. If you have questions about protecting your trademarks online, the Amazon Brand Registry program, or the false claims described in this alert, please feel free to contact us.